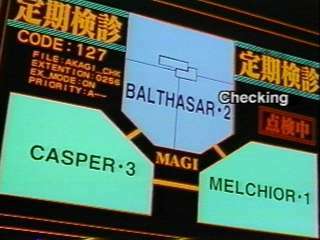 MAGI: The group of three supercomputers which operate and control New Tokyo-3. After a lengthy and routine diagnostic check, the MAGI is brought back online in order to perform new synchronization simulations on the three young EVA pilots and their machines, unfettered by their plug-suits. Unbeknownst to the rest of NERV, a new Angel has begun a deadly assault on NERV headquarters -- by creating nano-circuits and taking over the MAGI itself! Ritsuko races against time to prevent the latest threat from taking over New Tokyo-3! What religous significance is the MAGI?